Recently I wrote about working through Ruby's new hesitance to jump up on to the bed , (which is much-improved). 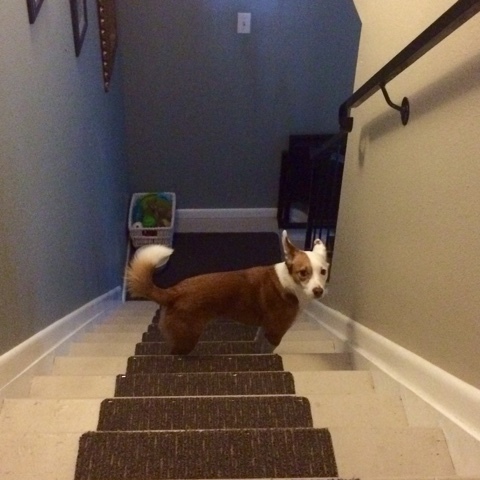 Around the same time I posted that, Ruby developed another confounding fear: going up the stairs. She would go about two-thirds of the way up, then stop and whine or turn around and go back down. My dad and I were both baffled; Ruby has been running up and down the stairs for more than two years. She very rarely goes upstairs without us. I installed a stair gate at the bottom when my senior dog Lasya developed a neurological condition that made her unsteady. We keep the gate closed when we're downstairs, and the dogs don't have access to the stairs when we're not home. The only time Ruby really goes up and down by herself is in the morning after breakfast when she comes back up to bed. My best guess is that during one of those trips she slipped and hurt herself or possibly there was a loud noise that she associated with one particular stair. In any case, it only serves to emphasize the profound effect that one frightening event, even unbeknownst to us, can have on a sensitive, fearful dog. We thought that her memory of that event might fade and the problem would resolve as she went up a few times with no issues, but actually got worse in the days leading up to my trip. At first she would dash the last few steps (again, like something was chasing her) and then she stopped trying altogether. If she could follow right behind me she was better, but if I went up without her no amount of coaxing could get her to take those last five steps. For some reason when it was bedtime she was fine to follow Boca and I up to bed, making me think she also associated whatever happened with time of day. When she was in the stairwell she was very jumpy, as if expecting something to reach out and grab her. Since October is a spooky time of year and I have been watching a lot of horror movies, I started to wonder if she'd seen a ghost. It was heartbreaking to see her so uncomfortable in her own home, and with something that had previously been not at all concerning to her. In the picture above you can see her wearing her worried ears. I was especially distressed about going on my trip, knowing my dad wouldn't take the time to coax her up the stairs and that he would probably spend a lot of time reading in his room. Rather than lament needlessly, I knew there was only one way to tackle the problem - desensitization and counter-conditioning - and I didn't have a lot of time. We needed intensive cheese therapy. 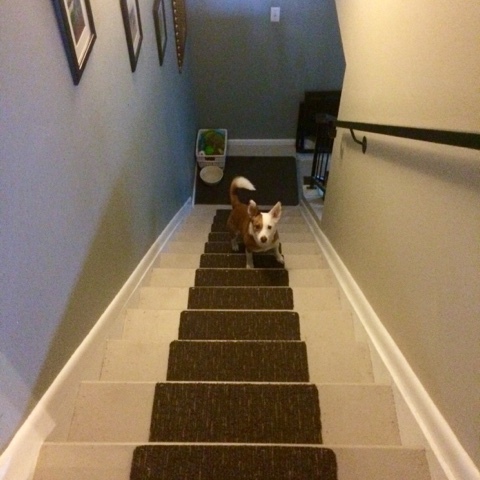 As I was packing for Phoenix, each time I went up the stairs I got one of The Ginger Sisters' highest value treats - yellow processed cheese product - and doled it out step by step as Ruby came up the stairs. At first it was a bite of cheese on every single step. Then she would go three or four steps at a time. At the top of the stairs it was a straight up cheese party with a celebration of Ruby's bravery. By the time my bags were packed, she was running all the way up the stairs without me, and when I called him from Arizona the first time my dad reported that Ruby was running up and down the stairs like nothing ever happened. I was so relieved and upon my return I saw that she had no more fear of the stairs - mysteriously materialized and dispelled with proven methods. Thank you, science and Kraft Singles! Yay Ruby! That's awesome that she was able to conquer the stairs so quickly! Great job! It was really stressing me out - we have enough challenges without a major one in the house that she was previously okay with! I wish I knew what happened, but I'm glad we worked through it. I didn't know you were in Arizona! I admit I am always surprised when I learn someone has willingly traveled or worse moved here. Good job on the cheese therapy! It really does make everything better!! I was there to see Madonna! I was really enjoying the weather...but I know when it's 110 I would not. I do dread and detest winter, though. You're so good with her!